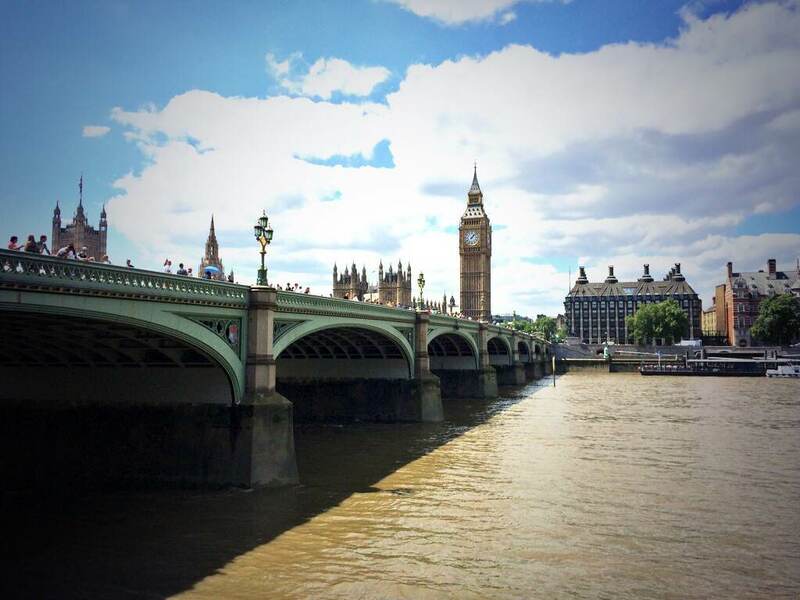 T’was a hot July day in London and I was lucky enough to attend what was my 4th Magento UK event with my developer colleague and buddy Tom Foyster (@TomFoyster). This year was better than all others in terms of location and community spirit. It was strange seeing the keynotes headed up by high-level Ebay representatives instead of Roy Rubin and Jimmy Duvall, whom we have become so used to hearing from each year. Anyway, here’s my diary and thoughts for the day… enjoy! The drinks were-a-flowin’ and the dance moves were-a-showin’ at the pre-show party. Tom and I arrived at about 8pm and enjoyed catching up with some familiar and many new faces. I particularly enjoyedÂ meeting Ben Marks who wasÂ unknowingly largely responsible for myself, Tom and Rob Kent (@kent_robert) becoming certified developers after watching theÂ Development Fundamentals videos. Myself, Ben and Tom – only 1 of us has a correct nametag. Four events in and I’m sure that one of my goals is to someÂ dayÂ drink as well as Karen Baker (@webshopapps). 64% of consumers have chosen an ecommerce provider over another due to free shipping. People hate to pay for shipping as this is something that you don’t need to worry about on the high street, so eliminate it if you can. 35% of UK ecommerceÂ sales are click & collect – a nice solution to my point above. Steve Denton hosted the entire event and delivered the first talk. Following Steve was Magento Live regular John Lunn. This guy could literally sell ice to an Eskimo and he’s not even a salesman. He’s always clear about PayPal’s product development, and he did a great job of getting people excited about PayPal’s newest acquisition of Braintree. The ‘Pay $10’ button aside, I would love to checkout to this. The new PCI-DSS compliant payment gateway which looked easier to use than a knife and fork sounded sublime, and the promise of 1-click PayPal purchases is a huge step in the right direction. Being Magento developers ourselves, myself and Tom decided to keep our 2nd row seats and stay in the Westminster Suite for the developer session. Stefan Willkommer began by talking about threading in PHP. I admittedly struggled with the concept until I was given an example of how it could work with product imports. In a nutshell PHP threading can help with store performance and developers should look into using this techniqueÂ going forward. Look at the data that Magento records in its log tables, and how valuable this information can be. 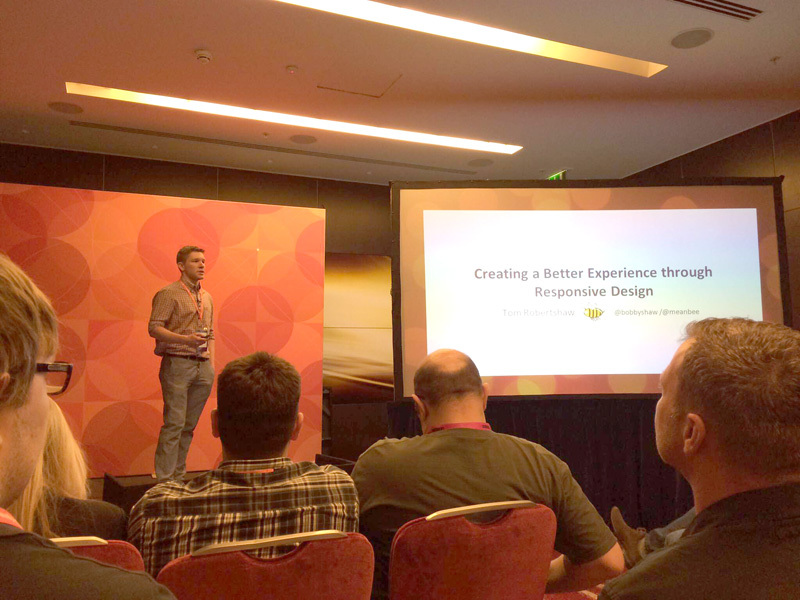 Meanbee director and Magento community legendÂ Tom Robertshaw (@bobbyshaw) delivered a great talk on responsive web design with Magento. Pay attention to the devices that your customers use. They can vary greatly depending on industry. Tailor your contentÂ and imagery to devices, but don’t strip out features and frustrate customers. Enhance your design and functionality through feature-detection and browser detection. All this information is now available to us. Always evaluateÂ code complexity against the needs of the business so you don’t pollute your code with unnecessary features. This wasn’t just a by-the-numbers talk about responsive, which would’ve been like preaching to the choir. Following a nice lunch and meeting some more members of the community we took a stroll outside and took a break by the Thames. What a beautiful day it was! The second general session was more Magento-focussed and was delivered very well by all involved.Â First,Â Craig Hayman wasÂ interviewed by Steve Denton in a fireside chat (without the fire). Steve compared the innovation and booming nature of the Magento community (or ecosystem as it’s often called) to that of IBM from an earlier time. He then went on to say that open source is a technology that will win every time, even against technology giants such as IBM. Open source is a technology that will win every time. Next up was Ben Pressley, Head of Magento Worldwide who reassuredÂ us all with mind blowingÂ stats about Magento and why we should stick with it. 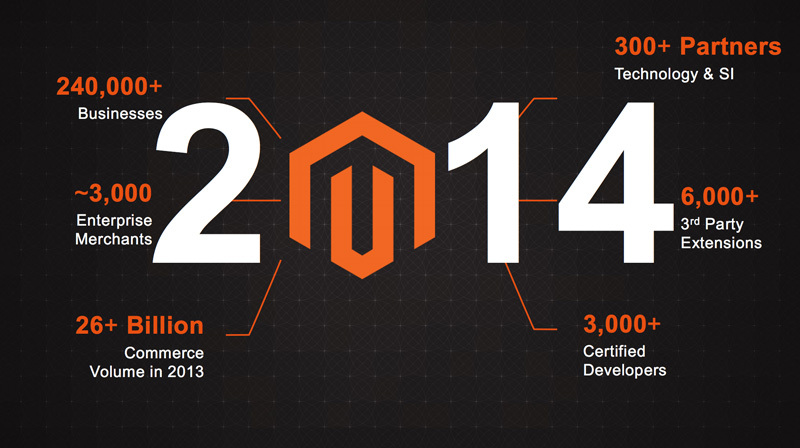 One that stood out for me was that almostÂ 1 in 3 online transactions goes through Magento. If that’s not a dominant market share, I don’t know what is. Even with all the momentum WooCommerce has, it still has a lot of catching up to do. BenÂ then went on to explain the market share growth in the last year in some of Magento’s key markets – the UK alone has jumped from 33% to 42%. It’s hard not to be impressed by numbers like this. As a Man Utd fan it didn’t excite me too much that Liverpool FC is now using Magento. 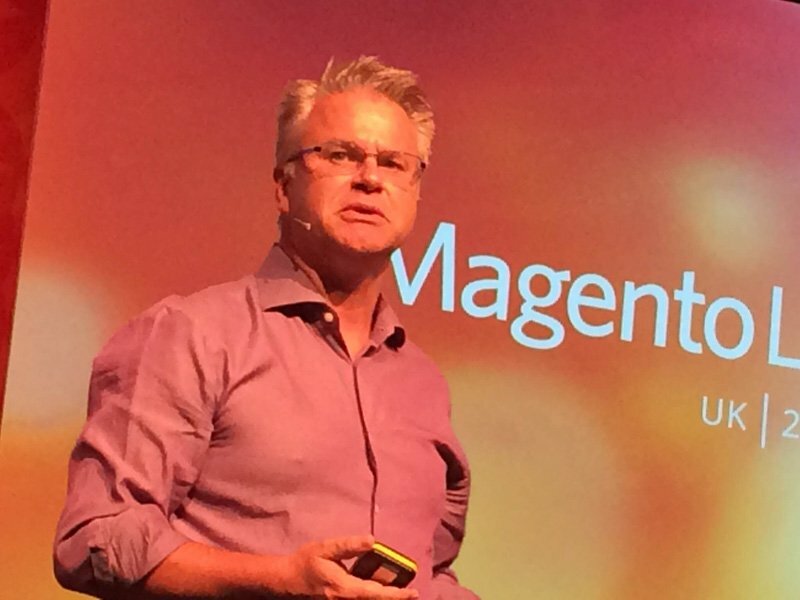 Magento CTO Brent Peters then took to the stage to deliver some news about the widely-anticipated Magento 2. 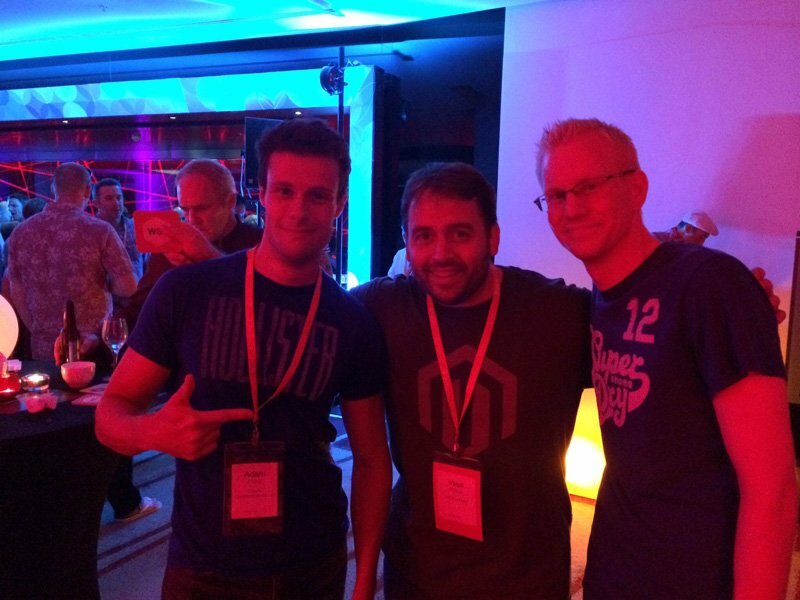 He went through the release approach and goals of Magento 2, most of which we had already seen before. Having played around with the dev version I’m very impressed with many aspects of Magento 2. The service layer, the switch to CSS compilers, the responsive theme, and the modularisation of all elementsÂ all seem great steps forward (beige-admin area aside). Ben Marks (@benmarks) was then invited to the stage to give us an update on plans for the Magento community and support for developers. I’m looking forward toÂ seeingÂ the updated Wiki, Docs and the blog resource library (don’t forget us Ben!). If you’d have not seen or heard of Dotmailer before, then you will have known themÂ very well by the end of Magento Live UK 2014. Ben Stavely (@bsstaveley) Â and Jonny Dixon (@jonnydotdixon) gave a detailed and funny presentation on how to use customer data and behaviour to fully segment theÂ way you market your products. You can find out a lot of things about your customers which will tell you a lot about what their interests are, when they like to buy, who they buy for and whether they’re influenced by discounts. Collect this data then target your email marketing to the right people. For example, if I buy lots of tins of fence paint regularly then don’t bother advertising indoor wall emulsion to me because I’m most likely an external decorator. Repeat customers spend up to 67% more than first time customers. 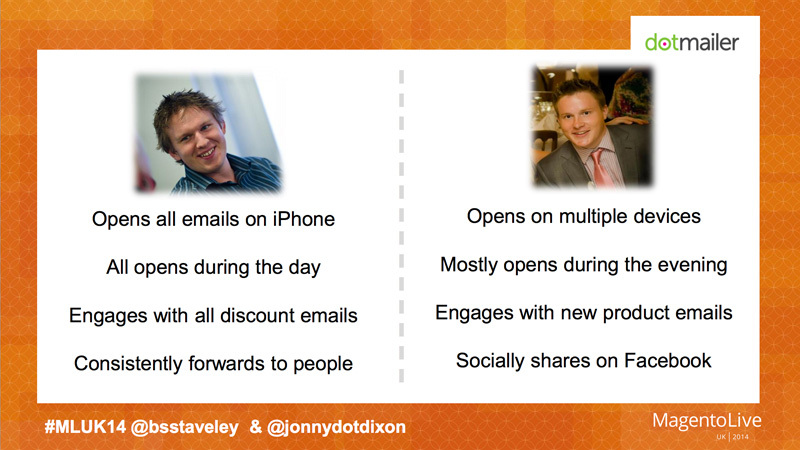 There’s also a lot you can learn from email opening behaviour. Things such as: How soon do they open their emails? What devices to they use? Do they respond to coupons? An example of two customers with different email reading habits. The key takeaway from this talk was to work hard on customer retention rather than first timers. Repeat customers spend up to 67% more than first time customers. Do this through better targeted email marketing, brand building and adding value to your service – don’t just focus on sell, sell, sell! I’ll be doing a post in the coming weeks about the best Magento extensions and solutions for personalised marketing. The final general session of the day included 3 talks. The first of which was a brief overview of challenges facing brands and retailers by Ebay Enterprise MD Michael Kliger. In a nutshell theÂ message was that everything can be achieved with Magento Enterprise + eBay Enterprise, which is great for Ralph Lauren and British Airways, but is perhaps out of reach for SMEs. The second talk was held by Pete Blackburn, eBayÂ MarketplaceÂ Head of EU Merchant Solutions.Â Following on nicely from the earlier talk he outlined a few ways to integrate Magento with eBay Enterprise. To be fair to eBay, they are gigantic.Â 70% of listings are new merchandise & sold at fixed price, so why not get your Magento products on there. The diagram below demonstrates the best route to an eBay marketplace depending on your store size. 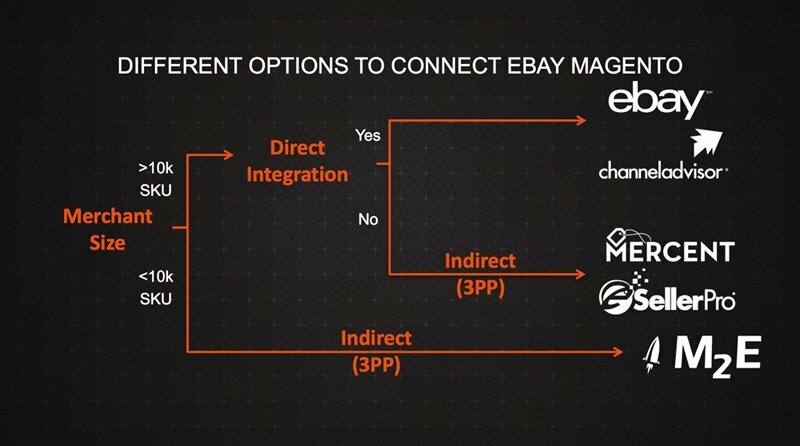 Link up Magento and eBay with these solutions. With this in mind, M2E is a superb platform for SMEs, and it’s something we are recommending to all our clients. The final talk of the dayÂ fromÂ author and PhDÂ Mariana Mazzucato, is one I won’t forget in a hurry.Â The subjectÂ was about debunking the myth that the private sector is sole provider of innovation, but in reality much of it is publicly funded. The best word I can use toÂ describe the talk is ‘relentless’. It’s a good job we stopped taking notes or our MacBooks would’ve surely burst into flames. The best word I can use toÂ describe the talk is ‘relentless’. Her points were backed up in meticulous detail. 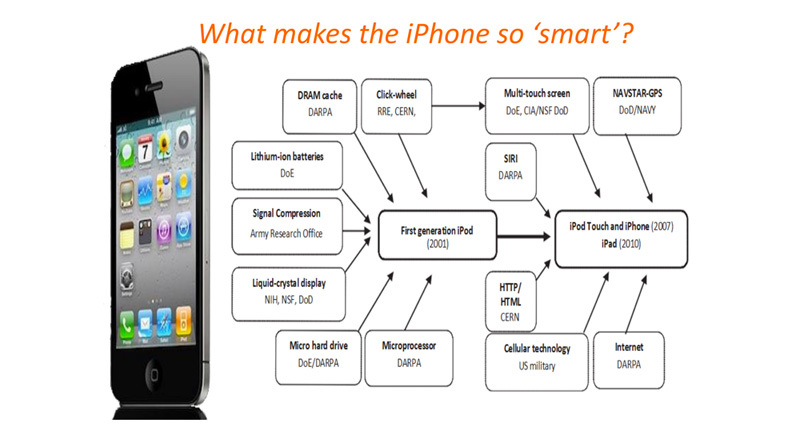 Most of the diagrams went completely over my head, but the one about the origins of the iPhone’s technology was of great interest. Did you know that CERN were responsible for the click-wheel? You didn’t think that Apple invented all these things did you? Mariana’s passion and subject knowledge were second-to-none, but I’m sure most of the detail of theÂ presentation was lost on large parts of the audience. We were having such a good chat with Ebay representative Lee Hadsock (@leeCommerce) that we missed the third set of breakout sessions, so nothing to report here. Sorry! Personalisation is becoming key to successful ecommerce in 2014. Merchants need to be customising the user experience and using market segmentation to market the right products to the right people. There’s a wealth of data available, don’t be afraid to go and get it and use it! eBay are fully behind the Magento project and are working hard to optimise their product range for businesses of all sizes. Click & Collect has become a hugely popular checkout choice among consumers, it can be implemented intoÂ pretty much any ecommerce website regardless industry. Magento are listening to the community with regards to Magento 2 – the ‘Buy-A-Feature’ stand at the event and Magento 2 dev repository (now at 91 commits) are testament to that. Magento Live parties still rock!